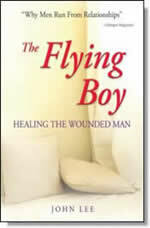 The Flying Boy: Healing the Wounded Man is a record of one man's journey to find his "true masculinity" and his way out of co-dependent and addictive relationships. It's a book for all men and women who grew up in dysfunctional families and are now ready for some fresh insights into their past and their pain. The Flying Boy is a story about feelings - losing them, finding them and finally expressing them. Here you will find people you know; will discover a way out of the pain and see that it really is OK to express yourself without fear. The book is about grieving, a very misunderstood process often confused with self-pity. The Flying Boy opens doors to understanding - men will understand themselves and each other, and women will more deeply understand men, learn how to be with wounded men and still take care of themselves. John Lee has spent 30 years guiding lives and relationships through addiction, recovery, emotional ruin, rage, grief, and desperation, and into new strength, hope, functionality and fulfillment. He wrote the bestseller The Flying Boy, as well as twenty other books, and he has been featured on Oprah, 20/20, Barbara Walter's The View, CNN, PBS, and NPR. He has been interviewed by Newsweek, The New York Times, The Los Angeles Times, and dozens of other national magazines and radio talk shows. John earned his master's degree at the University of Alabama, where he taught English and American Studies. At the University of Texas, he worked on his doctorate and taught Religious Studies and Humanities at Austin Community College. He is founder and former director of the Austin Men's Center where he ran men's groups and sessions for individuals and couples. Along with poet Robert Bly and others, John became a recognized leader in the Men's Movement and an early pioneer in the field of recovery and addictions—he has keynoted hundreds of clinical conferences around the world. He lives in Austin, Texas.